I can’t say enough good things about my Saeco Minuto Focus automatic espresso machine! I’ve been telling everyone about it – even the cashier at the grocery store who commented on the coffee beans I was purchasing. I had to tell her why I was buying them and then proceeded to tell her all about my fabulous new Saeco Minuto Focus. John gave me a look like what are you doing??? I don’t normally start conversations with perfect strangers, but I couldn’t pass up an opportunity to tell her all about it. The Saeco Minuto Focus is the first fully-automatic, bean-to-cup coffee machine that you can customize to suit your tastes. Today I wanted to share with you my favourite features so you can see what is so special about this machine and why I love it so much. 1. Coffee tastes AMAZING each and every time. I think having fresh beans really makes a difference in the flavour. 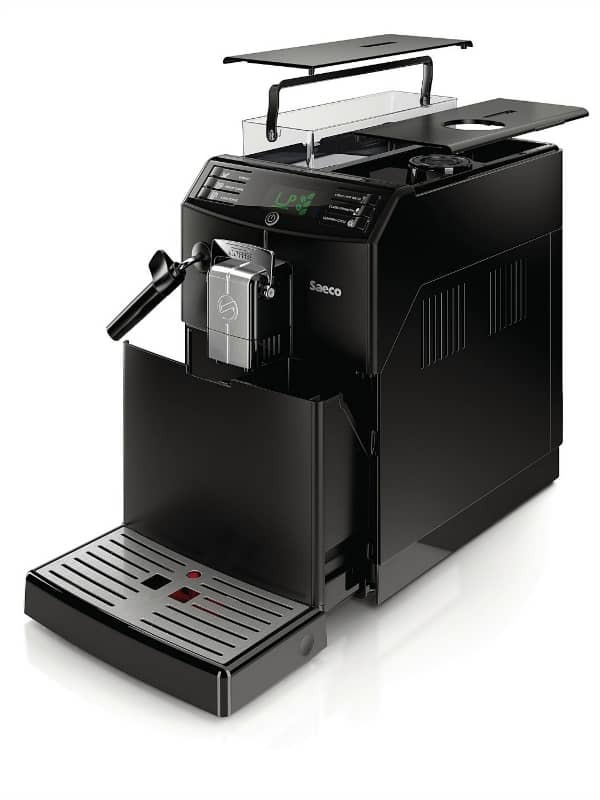 The Saeco Minuto Focus grinds the beans with its adjustable 100% ceramic grinder fresh for each cup you make. I add a little bit of cream and take my first sip and am met with perfect Italian coffee – hot and fresh as it should be. 2. Brew YOUR perfect cup. 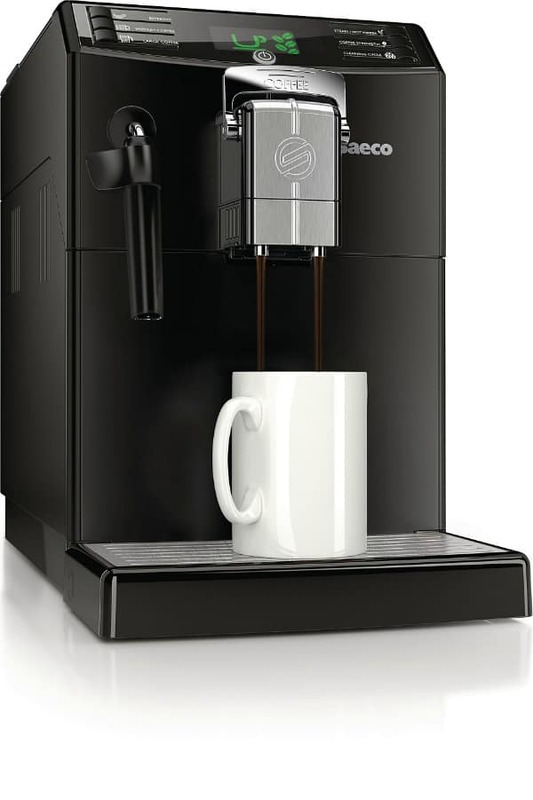 With the Saeco Minuto Focus, you can customize each cup to suit your preferences. The Memo function allows you to adjust the amount of coffee you want and its strength. John and I have the same preferences so our machine is set to how we like it. It’s easy to change though if we have guests over and they prefer their coffee stronger/weaker. 3. Prepare fancy beverages. I use my Saeco Minuto Focus to make my coffee everyday, but once in awhile, I’ll unleash my inner barista and make something fancier. The Saeco Minuto Focus Classic Milk Frother makes it simple to prepare lattes, cappuccinos and other specialty drinks. 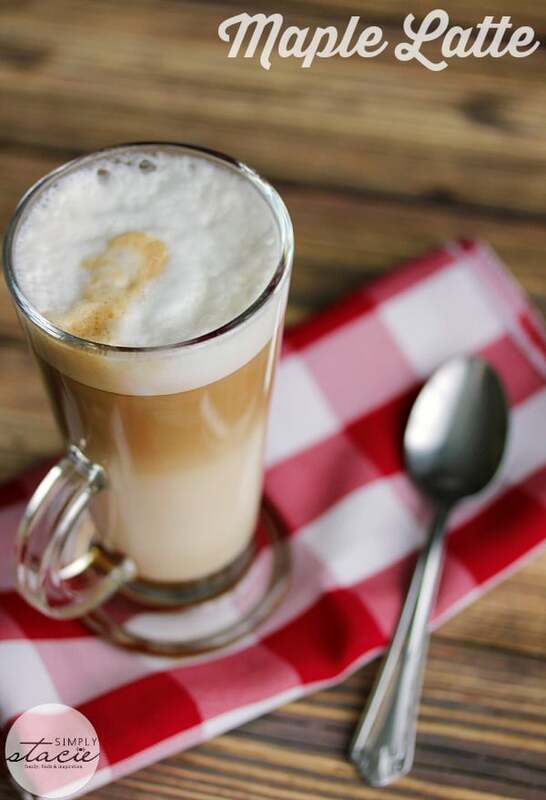 This recipe for a Maple Latté is divine and uses the Classic Milk Frother. 4. Brew coffee with pre-ground coffee. Sometimes you can’t find your favourite brew in bean format. Not to worry because with the Saeco Minuto Focus you can also use ground coffee. There’s a special compartment you add the coffee grounds to and then just choose the setting and voilá! 5. Dispenses hot water. My mom is a tea drinker in the afternoons so when she comes over I can quickly make her a cup of tea with the Saeco Minuto Focus. It saves me from getting the kettle out from the cupboard and heating up the water the old fashioned way. 6. Easy maintenance and cleaning. The display tells you exactly what it needs. It will show you when it requires more water, coffee beans, needs to be emptied and more. At first I had to look in the user manual to know what the symbols meant, but now I can easily recognize what it needs. The Saeco Minuto Focus automatic espresso machine has an SRP of $899. It’s a little pricier than other machines I’ve owned. However, the difference is in the taste and the other reasons I mentioned above. I feel it’s worth every penny. It uses coffee beans and pre-ground coffee which is cheaper than buying the pre-packaged cups/pods, in the long run. I also wanted to share some interesting statistics about Canadians and their coffee-drinking behaviours from a survey conducted by Vision Critical on behalf of Saeco. The majority of Canadian coffee drinkers prefer to make coffee at home for a few reasons: convenience, to get it just right, to save money or because they enjoy serving coffee to guests in their home. Canadians are a nation of coffee-drinkers with 78% consuming it on a regular basis. 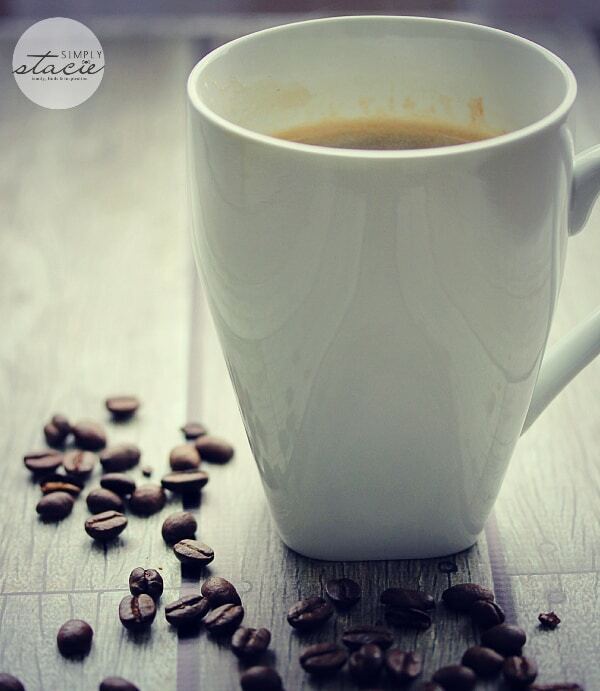 Quebec is the province with the most coffee drinkers with 83% saying they drink it regularly. Most Canadian coffee drinkers drink their coffee in the morning and less after lunch. Older Canadians are slightly heavier coffee drinkers and drink it for taste while younger Canadians drink it for its energizing effects. When it comes to making coffee at home, Canadians value speed, ease of use and the ability to customize each cup to its drinker. I found myself nodding my head in agreement as I read over these findings. Coffee is a big part of my day and I wouldn’t have it any other way! I like my coffee with just sugar added although I will have cappuccino and lattes occasionally. Would love to buy one of these for my husband but it is not in the budget for this year. I like cream and sugar in my coffee! 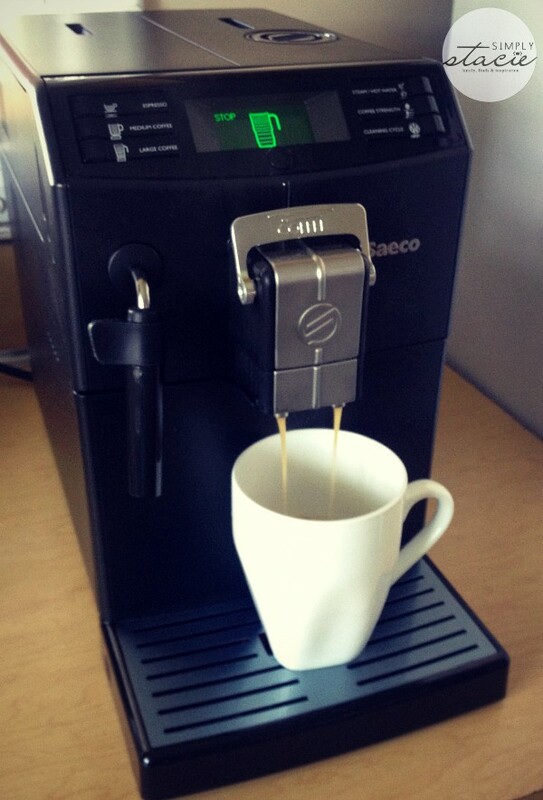 Sounds like this new Saeco machine makes a great coffee. I totally forgot about this brand over the years, but they are pretty reputable! I have to agree with you on the using fresh ground coffee making a better cup. I had a machine like this different company, and loved how fresh the coffee tasted. Thanks for a great review I may have to look into this brewer! This looks so great for entertaining! Probably to steep for most people but what an amazing machine, I love coffee and making the fancy coffee at home. Maple Latté sounds just like my cup of tea, or I should say cup of coffee, I’ll bet that would go down a treat. I used to have a similar machine and loved the fact that it ground coffee beans for each cup, I think it adds freshness and flavour to the coffee. I love super espresso machines and while $899 is a steep price, I think it is totally worth it for coffee lovers. I bought a Delonghi 4 years ago and have never looked back – totally worth it. I may try Saco for my next machine since I have heard many good things about it including here in this post. Thanks for sharing! I would love to have one of these coffee makers! I love trying different types of coffee. It is pretty pricey, though! This sounds like a nice machine. I like creamer and coffee over ice. I like black coffee but I like the foam that Saeco creates, love hot coffee with foam on top! I like any machine that could make a good cup of Wiener Melange. I like cream and sweetener in my coffee! Looks like a nice machine but it is way out of my budget! I have to have cream and sugar in my coffee. I would give anything if I could have a machine of my own! However I have not heard of this name brand before. I absolutely adore coffee! This would make a great Christmas gift ! I have to admit, I’m so envious. Those frothy drinks look so fantastic. I miss them from starbucks but they’re just too expensive. This would make a great gift for the coffee lover! I like my coffee with chocolate flavor, cafe mocha. That’s a great looking coffee machine, it looks very state of the art. Thank you for sharing this post. I’m a coffee lover too!